You know what the problem is with novel organizers? They let you track characters and scenes and such but they don’t let you track magic spells. Or starships. Or whatever else is important to you. I’m pleased to say that this problem is solved in Hiveword. You can now track anything you want in Hiveword. Spells and starships, sure, but you can also track political parties, countries, warring clans, fancy hats, guilds, ice cream, monsters, books, weapons, etc. 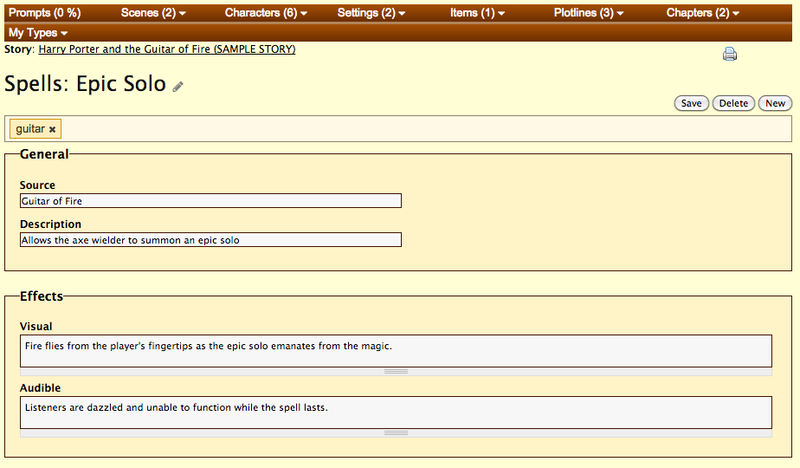 You can even track intangible things such as writing prompts or notes for key plot points. What you track depends on your needs and creativity. There’s a lot behind this simple screenshot. 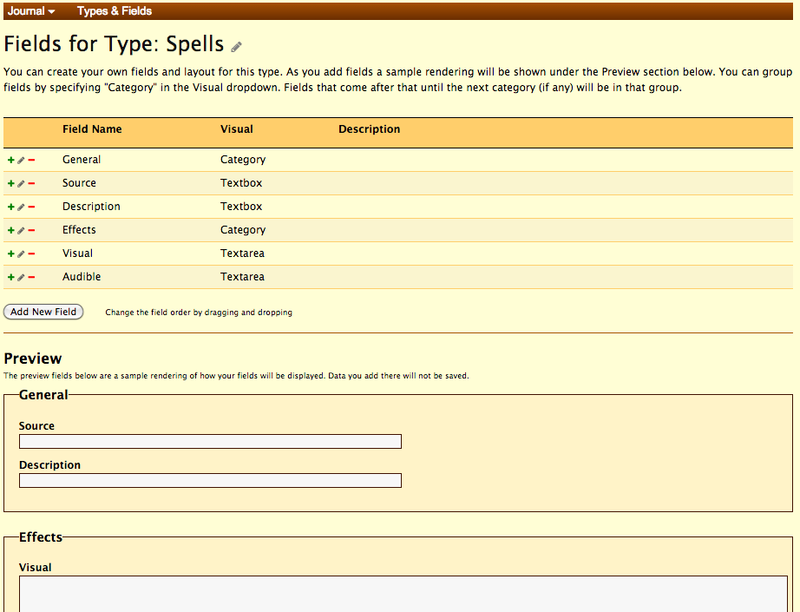 I created a type called “Spells” and now my stories have a menu called “My Types” which allows me to create a new spell just like I would create a new scene or character. The integration is transparent and consistent. As you add, edit, remove, or sort fields the preview at the bottom will show you exactly what it will look like in your stories. Notice that you can even group your fields. Powerful stuff. You add fields to existing types using the fields builder mentioned above. Entering data for the character is done exactly the same as always. 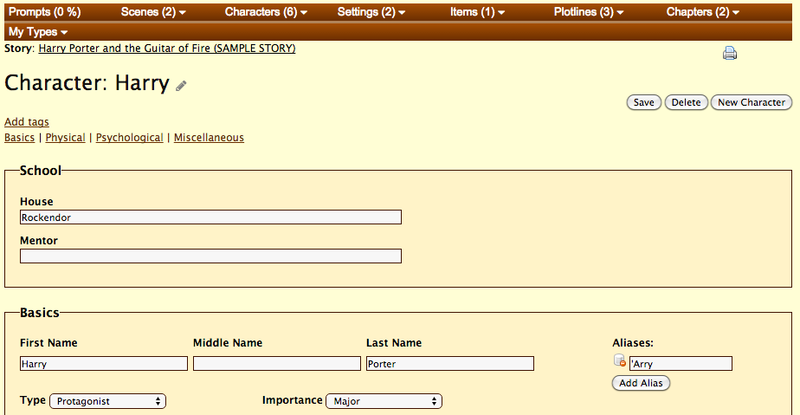 As you can see, custom types and fields essentially let you create your own personalized novel organizer. This is a Hiveword exclusive. This feature is part of Hiveword Plus which is a paid add-on to Hiveword. Hiveword Plus currently has custom types and fields and a writer’s journal. More features are coming. Right now you can lock in a low introductory price while I’m adding the new features. This is my way of thanking you for getting in early. To sign up, log in to Hiveword and click Upgrade at the top of the page or click the link above. There’s a 14 day free trial so there’s no risk to have a look. In my next post I’ll talk about the new Journal feature. See you then!